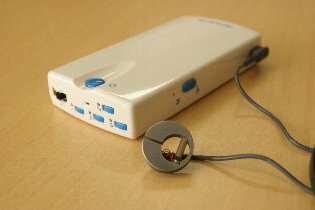 Because of the degradation of the cochlear function, low frequency sound becomes easy to mask high frequency sound. As one of the solutions, there is �gDichotic-listening hearing aids�h, it is inputs low frequency sound into one ear and high frequency sound into another ear. Our research results show that this processing is effective in helping the hearing-impaired people who can not distinguish frequency component or sound sequences. 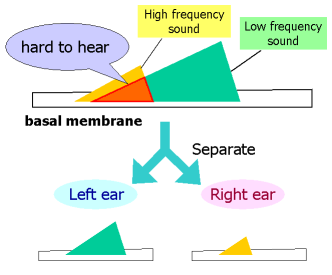 In addition, the problem of this processing, failure of sound localization in the front, can be mitigated by modifying the arrival time of the sounds that input a right and left ear. Normal-hearing people can extract a target sound even in a noisy environment (Selective binaural listening). Because of the degradation of this ability, however, hearing impaired-people have difficulty hearing in a noisy environment. We aim to improve their hearing ability in the noisy environment by recovering this ability. Sound direction can be estimated by using the interaural time difference and the interaural level difference. We propose an algorithm that evaluates these differences by a more proper method to auditory system and estimates the direction of target sound. 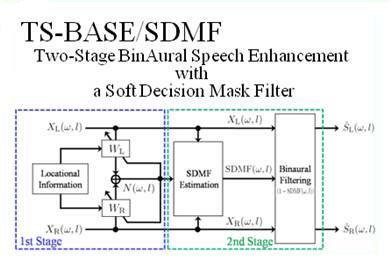 We also research on the method to detect speech signal in the sequences. Bone-conduction device transmits sound to the ear by vibrating not air but the bone. Because we can hear sounds without closing the ear, bone-conduction device enables us to enjoy music while we hear air-conduction sounds. The use of a piezoelectric device as the oscillator allows the device size to be smaller than the size of earphone. Using these advantages, we are planning to apply it as the sound-output-device of hearing aids and headset for call center.